Have you wanted to tap into the benefits of meditation, but you aren’t sure where to start? 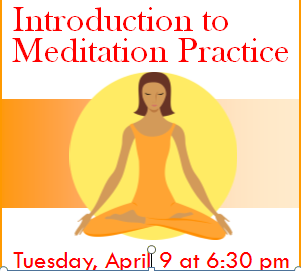 Join us on April 9 at 6:30pm – this program, led by local author Dr. Larry Smith and his wife Dr. Ann Smith, will equip you to start your own practice. Enjoy segments of guided and walking meditation, simple stretching, and meditation silence. This session will be followed by a question and answer period. Registration required here.